"No one is capable of encompassing all this, of course, and it would merely be a bore to read whole volumes," writes Solzhenitsyn in midstream. This lengthy volume is not a bore; it is ultimately numbing. Its predecessor, Parts I and II, described arrest procedures in the Stalin period, transports, and transit camps and prisons. 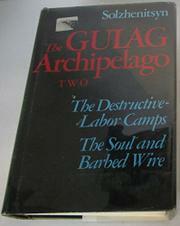 This book is devoted to the labor camps themselves, the final destination. From his own experiences and others' accounts, Solzhenitsyn reconstructs pus-filled deaths from pellagra, prostitution of women and bestialization of children, rule by thieves and stool pigeons, and every inch of cold, filth, and murderous labor. The dumb, austere span of Ivan Denisovich and the privileged realm of First Circle internment become a gigantic scroll of moral and physical degradation. It seems inane to pick an anecdote. Solzhenitsyn gives his material a fierceness and at the same time an anthropological elaboration--the nuances of mother-centered prisoner slang, the codes of the guards, the question of why suicide was so infrequent are treated with rich authority beyond second-hand chroniclers or other memoirists. The book begins with a sermon on Lenin's responsibility for it all. And the monument of corpses and exponentially destroyed lives ends with the message that such ordeals bring spiritual benefits! Solzhenitsyn concedes that the deceased may not agree. The impression remains that Solzhenitsyn's human sympathies have been scarred more deeply by his camp ordeals than he realizes. To adversely draw out the inevitable comparison with Dostoyevsky, he makes us feel the horror, but not the full love and pity. Nonetheless this is the most forceful thing Solzhenitsyn has written: after his last, crankish book to be published here (From Under the Rubble, p. 502), he reappears in full measure.